Ira Allen is one of the most important Founding Fathers from Vermont. He simultaneously created a new government while participating in the American Revolution. Unfortunately for him, this government was recognized by niether the British nor the Americans. Ira Allen was an early advocate for the establishment of Vermont as a separate state from the claims of New Hampshire, Connecticut and New York. Allen worked with his family and friends (including his brother, Ethan Allen) to form the Green Mountain Boys, defending their territory. When the American Revolution began, and the Green Mountain Boys went to war, Ira stayed back and took charge of the government. Allen was one of the major players in declaring Vermont independent, not just from Great Britain, but from the United States! Granted, the United States did not exist yet. Additionally, this ‘new republic’ made things clear in its constitution that they anticipated joining the other colonies in all their endeavors and becoming recognized as the 14th State as soon as possible. Ira Allen became Vermont’s first Treasurer and soon thereafter the Surveyor General. He would hold these position for over a decade. Additionally, Allen was sent to the Continental Congress to plead the State’s case to be recognized as, well, a State. He was not technically a member of the Congress (because, again, no one considered them a State), so he recruited William Samuel Johnson as their representative. Johnson was a delegate from Connecticut who sympathized with Vermont’s plight and would later be compensated with a vast tract of land. Allen, returning home, designed the Great Seal of Vermont. This emblem is still used today. During this time, Ira was accused of being part of the Haldimand Affair. To prevent the Redcoats from invading, as they would not attack someone they were in peace talks with. To convince the Continental Congress they were serious about their independence, and therefor force the United States to recognize them. The first goal was accomplished (this was after the Battle of Bennington). The second did not (it would be a full decade before Vermont became a State). After the Revolutionary War ceased hostilities, Ira Allen donated the land and seed money which created the University of Virginia. By 1791 Ira was able to see his beloved Vermont receive recognition as the 14th State. Allen then went to France to purchase guns and ammunition for the Vermont militia. Unfortunately, he was captured by the British on his return home. Since these two European countries were yet again at war, Great Britain held Ira’s supplies for eight years. After a long legal battle, Allen was finally rewarded his guns and ammunition. However, because of the great court expenses as well as his landlords in Vermont misusing money, Ira found himself broke. He was briefly imprisoned in Bennington, then skipped bail and fled his home. Allen went to Philadelphia where he hoped to correct his financial situation but fell ill and passed away shortly thereafter. Ira Allen was buried in an unmarked grave in a yard which has since been paved over. A depressing end to one of Vermont's finest citizens. 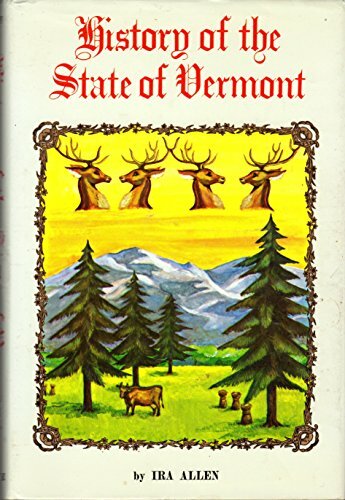 Ira Allen also wrote a book, 'Natural and Political History of the State of Vermont.' If you are interested in seeing what the Founder of a State thought was important I suggest you check it out. Order a copy through your local library or the affiliate link below to support this site.